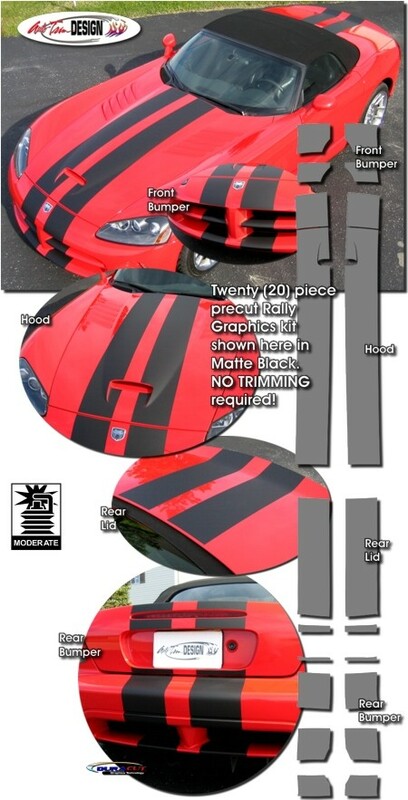 Make your '03-'06 Dodge Viper "Tough-looking" with this Bumper, Hood, Roof and Rear Deck Lid Rally Stripe Graphics kit. This stripe package is not just a box of straight strips. Our graphic kit consists of prefitted and contoured pieces as shown in the illustration - straight stripes will not work on this vehicle. Thus, due to the fact that this kit is created specifically for the '03-'06 Dodge Viper Roadster (convertible) or Coupe, it will not fit any other vehicle.